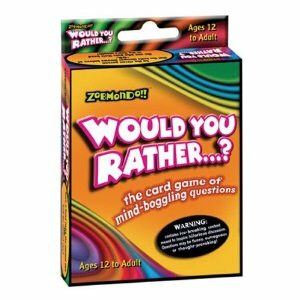 Last night, the game that my youngest daughter chose for us to play is one called “Would You Rather…?” If you’re not familiar with the game, it is simply a deck of glossy, colorful cards with four categories of questions on them: Appearance/Embarrassment, Ethics/Intellect, Pain/Fear/Discomfort, and Random (anything goes). The point of the game is to be able to guess which of the two scenarios your opponent is going to choose before she gives her answer. Being a rather active child, she, of course, chose the wheels. Yes, I am glad that this is just a hypothetical game. Then, if you guessed the same hypothetical scenario your opponent ends up choosing, you, as the card reader, get a point. 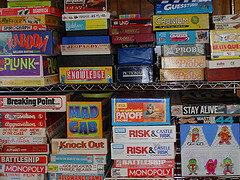 Some questions are rather difficult to determine what the other players will choose. Sometimes, though, the more difficult task is when it’s your turn to decide which of the less than desirable options to pick. Some are quite thought-provoking and others are downright gross. And for my daughter, the more gross the question, the better. Because we were so staunch in our convictions on this particular question, I thought I would put it out to you, wise readers, to prove that I am right see what you all would choose. It may divide us into our separate camps based on deep-seated loyalties, or it may show that you are as smart as me unite us under a common view. Either way, I am sure we can debate it like civilized humans without lowering ourselves to shamelessly throwing popcorn at each other while arguing our points. Would you rather have to try to elude the pursuit of Wonder Woman -OR- Batman? Weigh in on the debate below along with your reasons for chosing your superhero. I will reveal my stance next week so be sure to check back! I am trusting we can all keep it clean and keep it respectful. And since this is my blog, only I get to throw the popcorn. Depends on the purpose of the pursuit, Tami, and which actor is playing Batman. Val Kilmer Michael Keaton, I’ll pass. But George Clooney? Well, if Chris O’Donnell’s Robin isn’t available, Georgie will do in a pinch. I want to resume (begin anew) horseback riding lessons, so if Wonder Woman tied a knot in that golden lasso that I could untie and escape with, could come in handy. Especially if I took my ‘skills’ to the rodeo. So, did I avoid the popcorn shrapnel? Sherry – LOL! Totally agree with you on the George Clooney Batman. I am not sure why you’re being pursued, but I envisioned that I was involved in some kind of super secret spy thing in which I appear to be evil, but in the end I am not. Or something like that. Ok, if I had to choose, I’d rather be pursued by Batman, because the thought of being caught by an angry Wonder Woman is truly terrifying. 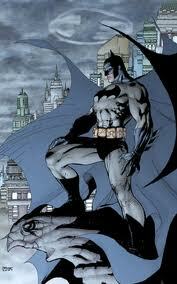 She does everything that Batman does, but better, and in heels. AND her belt could turn into a lasso or something, so she was seriously fashion-multi-tasking. Her outfit was doing some serious multi-tasking, though I’ve often thought the whole bustier thing to be a bit uncomfortable looking. In the picture of her above she doesn’t seem too bothered by it, though. She is fierce looking and I certainly wouldn’t want to piss her off. You definitely have to think with some practicality in mind when being pursued by a superhero. 🙂 Batman does have lots of gadgetry and can be quite formidable. Then again, so does Wonder Woman. I would rather be pursued by Wonder Woman ~ although I’m not too crazy about the truth lasso. (Never know what I might say!! yikes..) BUT she may have great fashion tips to share ~ so it evens out..
Batman just pops up outta nowhere in the dark and would probably give me a heart attack. I would like to take a ride in his cool car though..
That Lasso of Truth is quite scary. I’m with you on that – who knows what would come out of my mouth! Batman. Wonder Woman is too tough and all the actors I’ve seen as Batman have something to recommend them – even Adam West, in his Duddly Do-Right kind of way.